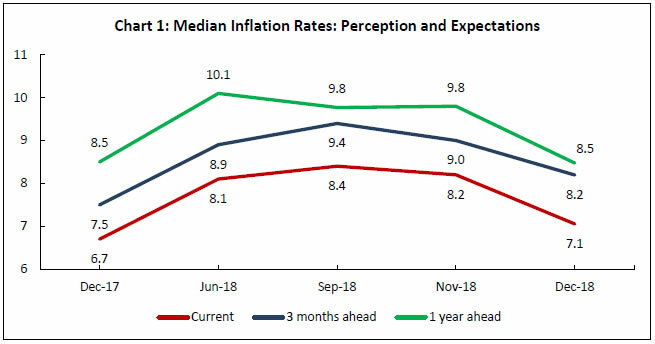 Today, the Reserve Bank released the results of the December 2018 round of the Inflation Expectations Survey of Households (IESH)1 2. The survey was conducted in 18 cities and the results are based on responses from 5,828 urban households. i. The proportion of respondents expecting general prices to rise in the next three months and one year ahead horizons fell sharply in relation to the November 2018 round with a similar pattern observed in respect of most of the product groups, and especially for food and non-food products (Table 1a and 1b). ii. Respondents also moderated their expectations with respect to the rate of future price changes. (Table 1a and 1b). iii. In quantitative terms, three months ahead and one year ahead median inflation expectations dropped by 80 and 130 basis points (bps), respectively, from their readings in the November 2018 round (Chart 1, Table 2). iv. The decline in quantitative expectations was observed across various groups of the respondents (Table 2). Note: Please see the excel file for time series data. 1. The table provides estimates and standard errors for qualitative responses for the September, November and December 2018 rounds. For earlier rounds, the results are based on sample proportions. 2. Constituent items may not add up to the corresponding total, due to rounding off. 3. The table provides estimates and standard errors for qualitative responses for the September, November and December 2018 rounds. For earlier rounds, the results are based on sample proportions. 4. Constituent items may not add up to the corresponding total, due to rounding off. Note: The table provides estimates and standard errors for quantitative responses for the December 2018 round. 1 The survey is conducted at regular intervals by the Reserve Bank of India. It provides useful directional information on near-term inflationary pressures and also supplements other economic indicators. However, these expectations are formed by the respondents and may reflect their own consumption pattern. Hence, these should not be treated as benchmarks for official measures of inflation. 2 As approved by the Technical Advisory Committee on Surveys (TACS), a two-stage probability sampling scheme was implemented in place of quota sampling from the September 2018 round onwards. Consequent changes in reporting the results of the survey are stated in the footnote to the respective tables. Further, city-wise sample size was revised in proportion to number of households of each city as per Census 2011, keeping the overall sample size 6,000.